Terrorists behead priest accused of collaborating with Assad's regime, then post a video of the beheading online. A Catholic priest has been publicly beheaded by Syrian terrorists after he was accused of collaborating with President Bashar Al-Assad's regime. Franciscan Father Francois Murad was executed along with two other people in the countryside of Idlib in northern Syria on Sunday, the New York Daily News reported. The brutal beheading was filmed and posted to the Internet. The Vatican confirmed Murad's death Monday, but the circumstances surrounding the 49-year-old priest's death are not entirely known, reported the Daily News. Spectators recorded the killings that included two others with their smartphones and cameras before uploading it online. Local sources told the Vatican that convent for the Custody of the Holy Land, where Murad had taken refute, was ambushed by terrorists linked to the jihadist group Jabhat al-Nusra (Al-Nusra Front). In the video, which Arutz Sheva has chosen not to post here due to its graphic nature, a man identified as Murad is seen sitting cross-legged in the grass with his hands bound as a mob of men around him shout in Arabic. Several are seen shamelessly holding up cameras to record the horrific killings, stepping as close as they can to the aftermath of bloody bodies. According to the Vatican's press release quoted by the Daily News, Murad traveled to the area after becoming an ordained priest to help construct a coenobitic monastery. The radical, jihadist Al-Nusra Front has pledged allegiance to Al-Qaeda chief Ayman al-Zawahiri. 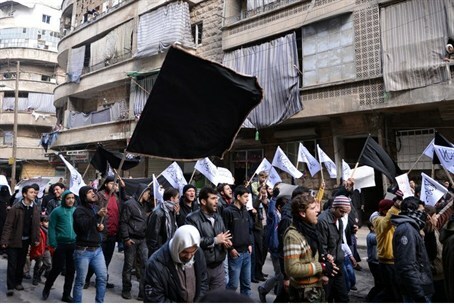 Al-Nusra is one of 13 factions in the radical Islamist rebel council that announced its secession from the main opposition force and declared its own Islamic state in Aleppo. The group was recently blacklisted by the United Nations Security Council.